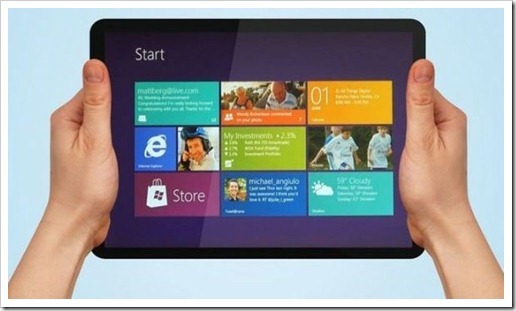 Why Microsoft is keen to enter the Tablet space ? Recently Microsoft gave indications that it would be unveiling its own tablet running a new version of windows called the windows RT. This news came after rival Google had completed the acquisition of Motorola Mobility and was soon to launch its own phone running the android platform. Both these cases are unique as this is after a long time that a software player was entering the hardware space. In the 2000’s IBM had set the trend of exiting the highly commoditized PC business when it sold its PC business to Lenovo. This was seen as a right move as price wars were eating into the margin of most PC makers. Since then Compaq merged with HP, which has since then led to the current situation where HP is facing multiple challenges and may be hiving off some of the businesses. Microsoft on the other hand was responsible for this commoditization when it allowed all PC makers to run windows as long as they paid royalty to Microsoft. Today windows contribute almost $ 4.6 billion to the Microsoft revenues per quarter. But lower end PCs and Laptops running Windows are seeing a challenge from a new offering from a very old player of the game, the iPad. Apple for a long time continued to be the only technology firm that owned the entire stack, from hardware, software and the operating system. The integration worked wonders for it during the launch of the iPod which was sleek, efficient and had the apple design all over it. Apple continued that march by unveiling the iPhone and then the iPad. Today the iPad contributes almost $6.59 Billion per quarter to Apple revenues. So definitely Apple is onto something and Microsoft wants in on the game as well. To add to the Microsoft’s worries, Google paid about $ 12.5 Billion to acquire the beleaguered mobility arm of Motorola. Soon the Google branded handsets would be seen in the market running the Android operating systems. So for the first time there would be Google branded hardware in the market. Microsoft has had limited success with hardware. The X Box gaming system had many issues with Quality and design in the beginning but since then has come a good example to follow for Microsoft. But its music player call “Zune” was an out and out failure. The player came and went without even denting the iPod market. So if Apple is where Microsoft wants to be then there are a few challenges, which they would have to overcome. Most products have good design teams. Apple has the best. The key differentiating factor on Apple products is the design which sets the bar very high for competitors. Samsung may sell more smart phones than Apple but can’t come close to the design of the iPhone. Design is something Microsoft will know little about. It may hire the top designers, but will not have a culture to fall back on. Apple banked heavily on its merchandising division. The store design and ambience was run by a separate division and did not fall under supply chain. Aptly named as the imagine store, Apple has probably the highest revenue per square foot area in the retail business. This is another area that Microsoft will have little experience in. They would have to rely on the retail channels that they use for selling windows and X box. Not the same experience as Apple. Apple has an army of brand fanatics. They are ready to pay the premium to buy an Apple. Microsoft does not have that luxury. Google is in a better position from that angle, but not Microsoft. They have to rely on pricing and this is a game that Samsung has perfected over the years. So in conclusion, Microsoft finds itself playing a game that they are hardly familiar with. Retail stores are a real estate game and building an army of brand fanatics takes time. And time is a luxury for the Redmond based giant these days.